publishing Status Reports/news items on specifications. The fifth Annual Review of Progress, published in June 2018, provides an overview of the main activities across a range of actions undertaken by Government Departments and their State bodies in 2017. The report also captures major deliverables for 2018. 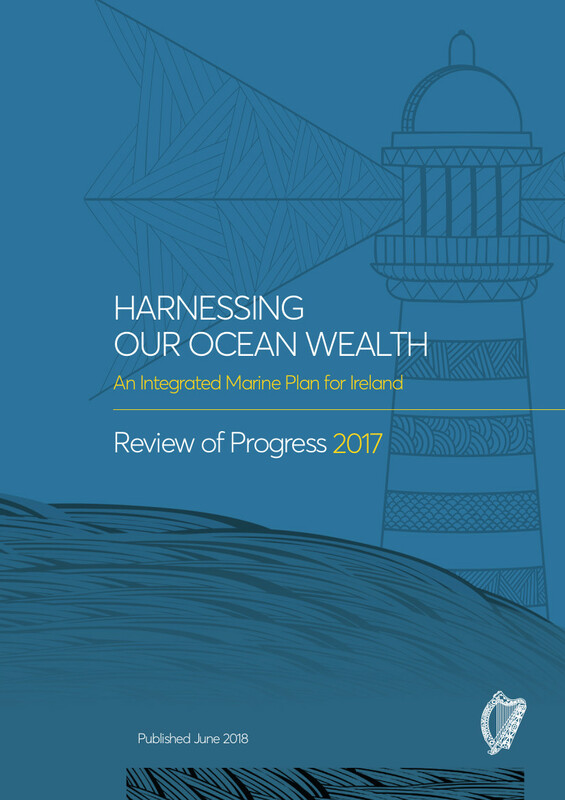 This fifth Annual Review of Progress coincided with the Our Ocean Wealth Summit that took place as part of SeaFest 2018, and formed part of the conference programme. Visit our publications page to download a copy of the latest and previous Annual Reviews. The annual Review of Progress coincides with the annual Our Ocean Wealth Summit. The first annual Ocean Wealth Conference took place in Dublin in June 2014. The conference discussed achievements to date, sustainable growth and employment opportunities for the future and the actions required to drive progress. The second annual Ocean Wealth Conference took place in Cork in July 2015. The 2015 event was expanded to include a series of events taking place across three days including Ireland's first national maritime festival - SeaFest. The third annual Our Ocean Wealth Conference took place in Galway 1st July 2016 with the theme ‘Into the Blue – Innovating for Our Marine Future’. The conference investigated how Ireland can innovate in each of the three goal areas of Ireland’s Integrated Marine Plan – Harnessing Our Ocean Wealth, namely: a thriving maritime economy, healthy ecosystems and engagement with the sea. The 2016 event was part of SeaFest 2016. The fourth annual Our Ocean Wealth Conference took place in Galway on the 30th of June 2017. This event brought together world renowned speakers, industry experts, business development agencies and the Irish business and marine research community for focused discussions the Summit's theme of 'Rethinking Boundaries and Innovation for a Sustainable Marine Economy. The Our Ocean Summit was held as part of SeaFest 2017. The fifth annual Our Ocean Wealth Summit took place in Galway on the 28th and 29th of June 2018. The event reflected a strong collaboration between Bord Iascaigh Mhara (BIM), Bord Bia, Enterprise Ireland, IDA Ireland, Fáilte Ireland, Science Foundation Ireland (SFI), Sustainable Energy Authority Ireland (SEAI) and the Marine Institute with individual sessions addressing environmental, economic and societal opportunities and challenges to creating a sustainable ocean economy for Ireland. The Our Ocean Wealth Summit was held as part of SeaFest 2018. Harnessing Our Ocean Wealth commits to the establishment of independently chaired Task Forces to address a number of actions outlined in the Plan. Since the launch of the plan, two Task Forces were established - An Enablers Task Force on Marine Spatial Planning (ETF) and a Development Task Force (DTF). Both Task Forces have completed their work and their recommendations have been presented to the MCG for consideration. Details are provided below. Copies of the reports were published at the 2nd Ocean Wealth Conference and are available on our publications page to download. A review of international best practice. The Task Force report and accompanying recommendations was submitted to the MCG at the end of 2013. Following consideration of the report by the MCG, the taoiseach announced in June 2014 his intention that the Department of the Environment, Community and Local Government (DECLG) would play a leading role in the development of a marine spatial planning framework for Ireland. In the period since the report was presented, members of the MCG, particularly the DECLG, continue to progress the development of MSP in Ireland. In 2013, the Development Task Force (DTF) was established to report to the MCG on four specific actions in Harnessing Our Ocean Wealth. Areas examined covered Business Development, Marketing & Promotion, Integrated Enterprise Strategy, Research, Knowledge, Technology & Innovation and International Education and Training. The report of the DTF represents the culmination of a significant body of work carried out over a 16-month period. As part of this work, a number of discussion papers and inputs were compiled by the members and secretariat. These inputs fed into the final report of the Task Force which was submitted to the MCG in early 2015. The report, endorsed by the Government, was published in July 2015. Visit our News section where you can subscribe to news updates.